What the heck is crème pâtissière, you ask? 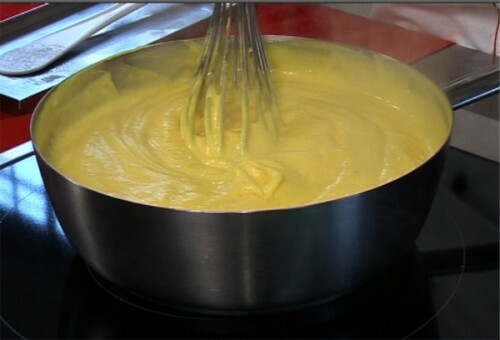 It’s a pastry cream used in many of the Martha Stewart’s Pies and Tarts recipes. The recipe makes about 2 1/2 cups of cream. Mix milk, vanilla bean and 1 cup sugar in saucepan. In separate bowl, beat eggs and remaining tablespoon sugar until thick. Sprinkle in cornstarch and flour. Continue beating until well mixed. Remove vanilla bean from milk mixture. Pour all back in pan and bring to boil quickly, whisking rapidly to prevent scorching. Remove from heat and pour in bowl to cool. Rub the top with butter to keep a skin from forming. Cover with plastic wrap and let cool completely before using. For lighter cream, beat heavy cream into soft peaks and fold into your cooled cream, using a wooden spoon.